It was shocking to read in a FaceBook posting on July 29, 2016 that Peter Sadlo, one of the leading percussion soloists in Europe, had passed away. The circumstances of his passing remain unknown to me as of this writing. In 1992 when NEXUS first met Sadlo, he was the Principal Percussionist (Solopauker) with the Munich Philharmonic Orchestra and the Professor of Percussion at both the München Hochschule für Musik and the Mozarteum in Salzburg. On June 10 and 11, 1992 NEXUS was in Germany in the middle of a concert tour, and we were Sadlo’s guests at the Munich Hochschule. It was the first time for us to meet him, and he seemed (to me at least) to be genuinely excited about our visit. The students who attended the NEXUS workshop on June 10 told us that there were rooms in the Munich Hochschule building that were locked and out-of-bounds, because they were filled with secret Nazi files and documents that had been stored there since World War II. The Hochschule was actually in the very same building that had been the headquarters of the Hitler’s Nazis during the 1930s and early 1940s. During the NEXUS concert on June 11, the thought that Hitler probably addressed audiences of followers in the very same auditorium where NEXUS was performing was a bit unnerving. Sadlo was a very gracious host to NEXUS during our brief stay. As soon as we had arrived in Munich there was an issue with our contract that, because of a translation misunderstanding, had to be resolved, and Sadlo took on the responsibility to make sure that the problem was addressed to everyone’s satisfaction. Then, after the NEXUS workshop, he hosted an extravagant dinner for NEXUS at a fine Bavarian restaurant, and treated us to a very expensive ice-wine (with a memorable complexity) during the dessert course, while we discussed our tour experiences, and mentioned that we would be driving to Prague the next day. The recent fall of the Soviet empire had opened the floodgates of west Europeans traveling to the newly accessible east because the currency exchange rates were so favorable. Sadlo told us that he had already been in Prague to buy precious art works at bargain basement prices. I remember thinking that Sadlo and Vic Firth both had an interest in the pursuit of fine art. After Munich the next time NEXUS crossed paths with Peter Sadlo was in October, 1995 at the Mozarteum conservatory in Salzburg. NEXUS participated in a masterclass for his students prior to our concert. In the masterclass one of Sadlo’s students (Henning) gave what for me was the most satisfying performance of Elliot Carter’s solo timpani pieces that I’ve ever heard, with utmost attention to the sounds indicated by Carter’s notation. Looking back on that experience, I have come to realize that Sadlo must have been a great teacher, and that it has been my misfortune to never have heard him perform live. I never crossed paths with him again. Immediately after Salzburg NEXUS went to Hamburg to record our tour repertoire at the NDR (North German Radio) studios for a new CD on the KOCH label. Peter Sadlo would also be a featured soloist on the CD, playing pieces by Bertold Hummel and Elliot Carter (including two of the solo timpani pieces). 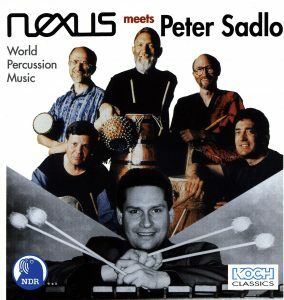 The CD “NEXUS Meets Peter Sadlo” was released on August 1, 1997.